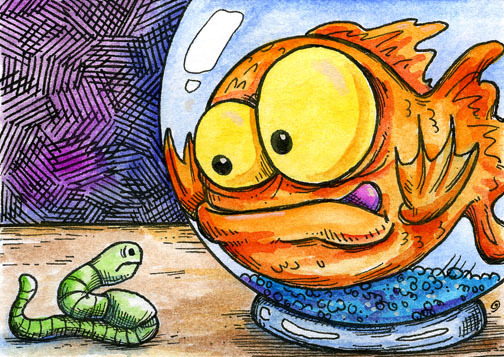 Here's my entry for Illustration Friday. The word is Invention. I just had time for a pencil sketch this week. Also, I have some ATC's on Ebay for those of you that are interested. If you wanna see them just follow the link on the right. Take care! Here's a new picture that I did for the Kerrville Humane Society. 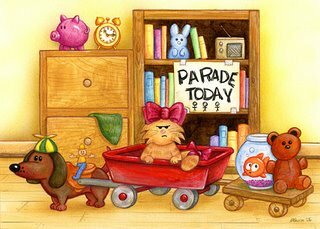 The title is "The Shortest Parade". I made an exclusive limited edition set of 50 prints that I hope they can sell. They are attending a show in Comfort Texas on Saturday if you want to buy one or if you wanna donate to them you can go to their website here. I almost didn't make the deadline on this one, but better late than never. I kind of have two "clears" on this one. The glass is clear and I think the fish's intentions are clear. This is done on bristol board in an ATC format that I will make eventually make available for sale on Ebay. 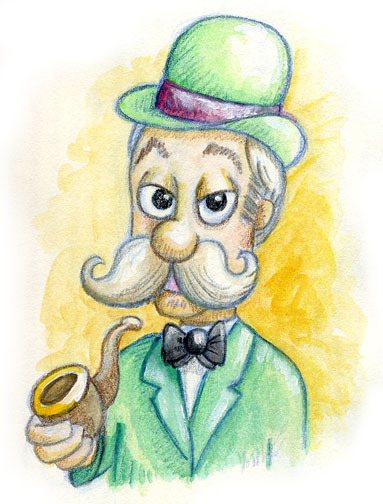 Here's a quick watercolor sketch of a guy for Illustration Friday. I actually did this a few months back so I'm cheating, sorry. But hey, he's smoking a pipe and it's never been posted anywhere before, so there. nyaah. Also, I put up 3 new items for sale in the "originals" sections for those of you that collect art.